If you are looking for a destination wedding, then there is so much to choose from in the sunny Caribbean Islands! The islands are incredibly tranquil and just listening to the sound of the sea gently lapping at the shore will make you think you’ve gone to heaven! The white sand beaches and crystal clear waters are a dream back drop for your wedding. Scuba diving couples will fall for the Cayman Islands, St. Croix, and Bonaire. 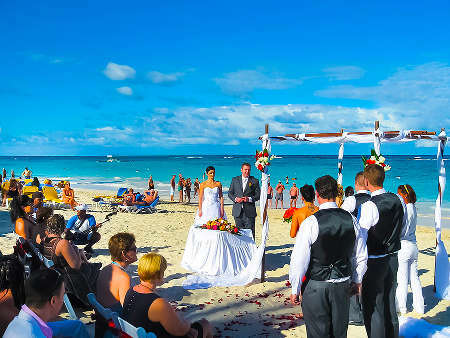 If you plan to hit the fairways after you say your vows, opt for the Dominican Republic, Jamaica, or Puerto Rico. And if you want a romantic island ceremony with a European twist, St. Barts, St. Martin, and Martinique are très magnifique! The best time to go to avoid rain and hurricanes is November through June. 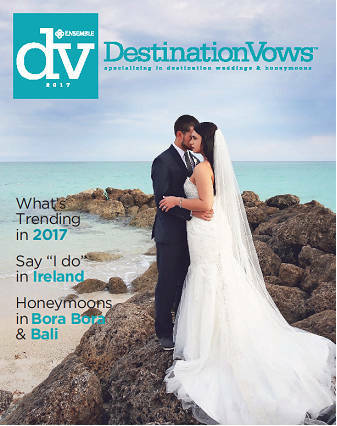 There are a growing number of mid-range and deluxe all inclusive resorts, smaller boutique properties and larger upscale chain resorts offering a variety of wedding packages. Nearly all of these resorts offer their own on-site wedding planners to assist in all facets of your memorable occasion. Many resorts offer discounted or free basic wedding packages depending on the number of rooms booked. Another major benefit is that it is relatively affordable and easier to travel to the Caribbean for your guests than other areas. With more air capacity to many Islands your friends and family will be more likely to attend. Because of the beauty of the Caribbean and resorts, the vast majority of couples that choose a destination wedding make their honeymoon an extension of their wedding. The Caribbean offers many opportunities for you to do more activities with your guests, including a private cocktail reception, dinner, group excursions or discounts on spa treatments. Let Shadyside Travel’s experienced destination wedding specialist set up a worry-free event for you. We will assist you in making the right choice of resorts, and handle all air and resort reservations for you and your guests. Our toll free number will let your guests call us from anywhere in the country.